Incredible! This film will definitely blow you away. Honestly, the most gritty and gut-wrenching crime-drama that has come to the silver screen in a long time. Both Robert Downey Jr. and Robert Duvall give the best performances of their respective careers. The emotional roller coaster of a film, will take you on a journey into the lives of a father and son who couldn’t clash more than oil and water. Follow this gripping story of family, justice, and estranged relationships as the very passion, with which the screenplay was written, is felt in every frame and even offscreen. There is no stone left unturned in this unabashedly adult earthy drama that will simultaneously prompt feelings of disgust and laugher throughout the masterpiece. Although we are still a ways off from calling Oscar noms, this one is likely destined for that coveted Best Picture nomination, as well as others. It is hard to believe that the same director who brought us Wedding Crashers and Fred Clause brings us this uninhibited drama about the murder trial and dysfunctional relationship between the highly respected veteran small-town Judge Joseph Palmer (Duvall) and big-city defense attorney, and savior of the unsavory white-collar criminal, Hank Palmer (Downey). The Judge is about the “big city lawyer Hank Palmer who returns to his childhood home where his father, the town’s judge, is suspected of murder. Hank sets out to discover the truth and, along the way, reconnects with his estranged family” (IMDb). Having first desired to work with an attorney in the quaint Norman Rockwell-esque Indiana hamlet, after the state sends the steely prosecutor Dwight Dickham (Billy Bob Thornton), Judge Palmer must turn to his estranged son. Facing the past he so desperately wants to disconnect from, Hank must work with his obstinent and incorrigible father to develop the defense for his father’s murder charge amidst mourning over the loss of a loving wife and mother of three sons. This is the first heavy drama–actually drama period–from David Dobkin. It is very likely that when Warner Bros. and Village Roadshow studio executives reviewed his screenplay that they stated to themselves “but this isn’t funny.” And, they would be correct. Until now, Dobkin has supplied audiences with outlandish comedies. However, back in 1998, his breakout film Clay Pigeons was his first attempt at a crime-drama. And even though it was filled with sinister crimes and macabre themes, at the end of the day, it was still a comedy. 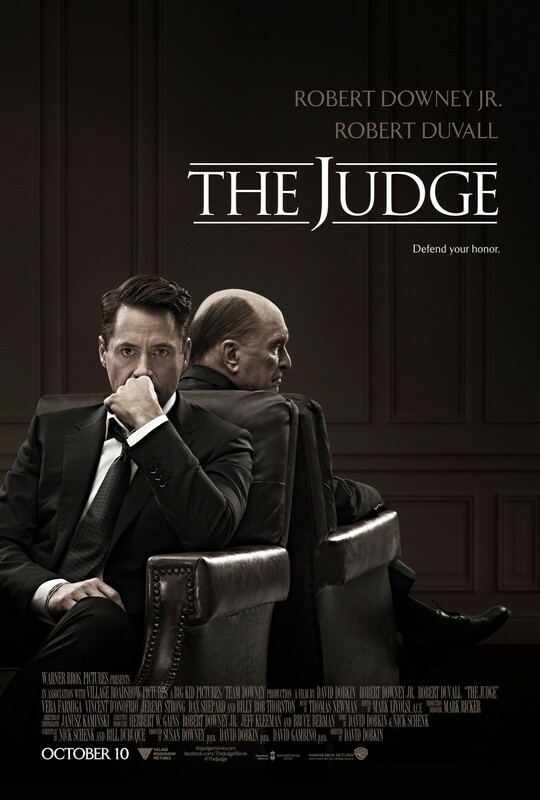 The Judge is a complete 180 from the past Dobkin films. If it was unclear whether he could prove himself to be a serious filmmaker–reaching emotional depths seldom reached by directors–this old-fashioned return to the power of “story” will convince you that he is destined to create cinematic masterpieces in the future. Seemingly a chorus line that even Marvin Hamlisch would be proud of, occurring at regular intervals, skeleton after skeleton emerges from the dark closets of this prominent family. And each one forces the respective family members to face them despite the past traumas. Each Palmer family member is a different character archetype. There is eldest brother Greg Palmer who was destined for the major leagues but after a severe car accident in his youth, his promising baseball career was snatched from his grasps. Next to him in age, is Hank. And, the youngest sibling is Dale who suffers from a cognitive disorder prohibiting him from being completely autonomous; however, he is great with an 8mm video camera that ironically captured both the dark and memorable moments from the family and serves as a sort of exposition, filling in the gaps from the past. As the epitome of a family patriarch, Judge Palmer is the anchor for his family, with the exception of Hank who wants next to nothing to do with them. Beyond the edge-of-your-seat criminal trial proceedings, ultimately, it is the father-son relationship that is truly put on trial before the audience. Screenwriters Nick Schnek and Bill Buboque have so carefully and meticulously crafted the story that the audience will always be wondering whether Hank and Judge will go full force at one another; and, will be forced to wait until the end to behold the no-holds-barred emotional fight between the two strong-willed individuals. Accompanying the brilliant direction and writing, cinematographer Janusz Kamiski will use the camera lens to tell the story of anguish and reconciliation beautifully. Thankfully, the movie includes some humor sprinkled throughout the film, and this can likely be attributed to Dobkin’s penchant for humor. Had this been left out, it is entirely possible that the movie would be too emotionally heavy and draining. Highly recommended for anyone who loves witnessing true-to-life characters in real-life situations. Due to repeated usages of adult language, it is not a movie for children. But, it is an inspirational movie for anyone who is either currently dealing with or has dealt with dysfunctional/reconciled father-son relationships. If you loved the story, chemistry, and uninhibited dialog and action in Kramer vs Kramer and the timeless classic tear-jerker Terms of Endearment, you will truly enjoy experiencing the powerful story in The Judge.